Fewer cross-border shoppers are making the trek south now that the loonie is languishing. Fewer B.C. residents are driving into the U.S. now that the loonie no longer goes as far south of the border. New data for January, February and March from the Canada Border Services Agency shows there were nearly 14 per cent fewer trips by southbound Canadians at Lower Mainland land border crossings compared to the same months of 2014, and a nearly 20 per cent drop from 2013. The loss of appetite for cross-border shopping was most apparent at the Aldergrove crossing, where trips were down 32 per cent from a year ago, and at Abbotsford-Huntington, which was down 18 per cent, while the decline was about eight per cent at the Peace Arch and Point Roberts crossings. Retailers in northern Washington depend heavily on Lower Mainland shoppers, he said, and their local governments, in turn, need the resulting flow of sales taxes to maintain services. 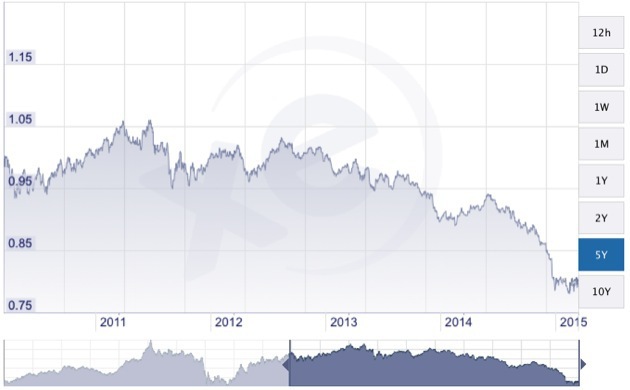 He noted the drop in southbound road trips closely mirrors the dive of the Canadian dollar. The loonie is worth just over 80 cents U.S. as of Tuesday and has dipped to as low as 78 in recent weeks. That’s a 12 per cent drop from 91 cents U.S. a year ago. Last year was the first year since 2009 that the loonie spent much time below 90 cents and it was close to par for much of 2010 through 2013. Meredith said the shift is good news for Canadian businesses that now face less intense competition from U.S. retailers. It may also mean more tax revenue for the province and even TransLink through its gas tax if B.C. families shop closer to home. “Some of the tax dollars that used to go south and support their infrastructure will be staying here to support Canada,” Meredith said. He also predicts a good year for tourism operators in B.C. as more Americans head north to take advantage of their strong greenback. Tourism Vancouver has already recorded an 8.2 per cent increase in U.S. overnight visitors to Metro Vancouver in January. Retail Council of Canada spokesman Mark Startup said he’s less sure Americans will come north because of the dollar differential, noting they don’t follow currency changes as closely as Canadians. “It’s interesting that when the Americans have got massive spending power in relation to the Canadian dollar it seems to be less of an incentive for them,” he said. Startup said the decline in crossings isn’t surprising and added the drop in the dollar is clearly the main reason. As a result, competition from U.S. retailers has faded as a prime concern of his members, Startup said. Startup said two other factors influence cross-border shopping – the ongoing advance of online retailing and the growth in foreign retailers operating in Canada, who he said offer easier access to products that in past years when a trip to the U.S. was required.